The Allison Mansion, with its outstanding craftsmanship, scale, and landscape architecture, is a prime example of an Art & Crafts Country Era estate. 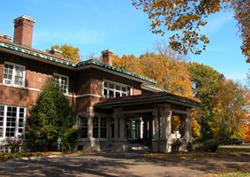 The estate was home to James Allison, one of Indy’s most important automobile entrepreneurs of the early 20th century. He co-founded the Prest-O-Lite Company, which produced the first efficient headlight for early automobiles, and helped develop the suburb of Speedway, designed for the people employed by Prest-O-Lite. Allison was a founding partner in Carl Fisher’s Indianapolis Motor Speedway. He also started Allison Engineering Company, which developed into an aircraft engine maker, known today as the Allison Division of Rolls-Royce. In 1936, the Sisters of St. Francis of Oldenberg, Indiana purchased the estate of James Allison and relocated Marion College there. Allison fired Bass before the interior was completed and hired William Price of Price & McLanahan, Philadelphia, to design the luxurious interior. Bass’s design is said to resemble a villa in Lombardy. Visitors will find that it also was inspired by the Arts & Crafts movement. For the grounds, the Allisons engaged renowned Prairie School landscape architect Jens Jensen. Close to the house, a player’s green for dramatic readings, semi-circular stone columned pergola, and brick walks remain intact. Below the bluff in the flood plain, Jensen laid out a series of ponds and a meadow, now used as ball fields. The Allison Mansion is located on the near-northwest side of Indianapolis at 3200 Cold Spring Rd on the grounds of Marian College. The grounds are open to the public daily dawn to dusk. Interior tours depend on scheduling of rentals and events. Inquire at front desk during business hours or call 317-955-6120. For additional information, visit the Riverdale—James Allison Mansion website. Visit the Wheeler—Stokely Mansion, just to the south. INDYGO bus line from downtown: #15 Riverside, disembark at 30th and Cold Spring Rd. ; walk north on Cold Spring Rd. The James Allison Mansion has been documented by the National Park Service's Historic American Buildings Survey.